Preparing a pumpkin ready for carving or decorating can be a bit of a tedious and messy job. It pays to leave plenty of time to complete this before you start transforming it into a Jack O' Lantern. Discover how to hollow out a pumpkin for Halloween with photo instructions on this page. Hollowing out a pumpkin is not all that difficult and can be done without using any special tools at all. Most standard sized pumpkins are easy enough to cut, scoop out and prepare ready for carving into a fun Halloween decoration of your choice. Follow these step by step instructions to get the job done quickly and cleanly. First you need to decide on what pumpkin you will buy. Note that the bigger you choose, the more effort it will take to scoop out the insides and prepare it ready for carving. When you choose your pumpkin, check the skin for any imperfections such as soft areas, cuts and gashes and any damage. Damaged pumpkins will likely start to rot and spoil earlier so it is worth taking your time to pick one that has no obvious imperfections. Check how the pumpkin sits on a flat surface as well. You want one that sits nicely once it is carved for Halloween display. You don't need to spend a fortune if you want a smaller sized pumpkin. I picked mine up from Asda for £1 so no great loss if the carving turns into a disaster. I'd recommend getting inexpensive ones to practice carving on if you've never attempted this before. 🎃 Let me be clear: you do not normally need any special tools to cut the lid off your pumpkin or to scoop out the insides. 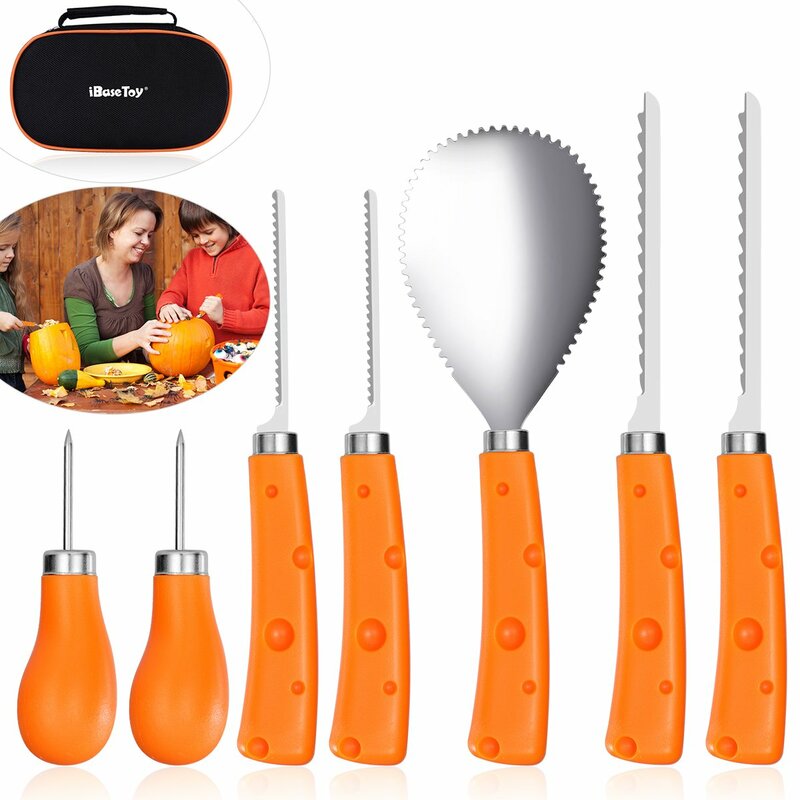 However, there are pumpkin carving tools that can help to make the job easier, faster and have better finished results. For cutting a straight lid off the top so that you can hollow out the insides, you can use a large serrated edge knife such as a bread knife. Most medium to small sized pumpkins are easy to cut with a knife like this. You might have a job and struggle to cut large sizes with a standard knife. With a serrated knife, choose how far down you want your lid to be. Do you want to cut off a large lid for your design or a small one? The lid needs to be big enough for you to get your hand into the insides to clean it out. Mark a line with a non-permanent marker pen where you will start cutting and then saw straight across with the knife to cut the top off along with the stem. 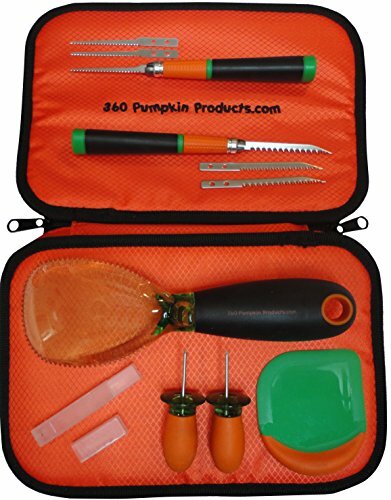 While you don't actually need any special tools in the majority of cases, pumpkin carving tools can help to make the job of hollowing out your Jack O' Lantern much easier. You can also end up with a much neater job too when you have the right tools on hand. If you want to cut a very small lid from the top of your pumpkin, you might find this difficult using a standard knife. If you want to cut a lid with a decorative line such as a jagged edge, a small saw designed specifically for carving should make this job so much easier. And if you have a large and tough pumpkin, you may well wish you'd bought the proper tools to cut through it. With a pumpkin saw, this is a little tool with a serrated edge that you push up and down into the skin and gradually move it in the direction that you want to go. 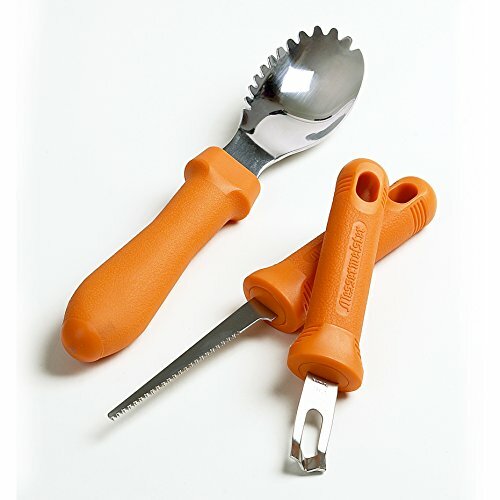 This enables you to cut or carve a lid with whatever shape you want. You then pry the lid off. Cleaning out the inside of the pumpkin and scooping out the seeds and the flesh can get messy. You may want to do this on a tray or use a disposable table cloth that you can get rid of afterwards with all the unwanted bits inside. I like to keep the pumpkin seeds because they are delicious cleaned and eaten after roasting. So I will separate these from the pulp, flesh and stringy pumpkin parts after it has been scooped out. 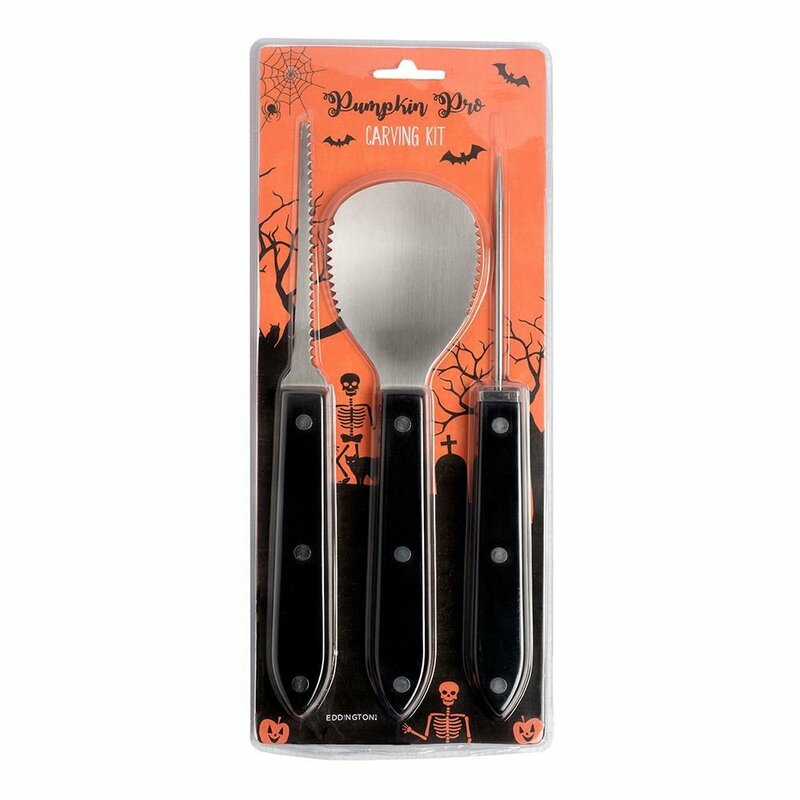 For scooping out the pumpkin, you may have a special scraper or scoop tool in with your pumpkin carving set or you can use a large metal spoon which also works. Use the spoon or scoop to scrape out all the pulp from the inside. It will feel cold and slimy. This is the least favorite part of the job but necessary if you want a hollow pumpkin for carving a design into. I put all the contents onto either a tray or in a big bowl. Make sure you scrape out all the flesh, pulp and seeds. If you want to keep the seeds for roasting, you will need to pick them all out. I pick mine out and place into a colander so I can clean them up easily. The final job you need to do is to thin out the inside walls of the pumpkin until they are around an inch thick. This will make carving your design into it much easier. If you are planning on only cutting into the front of the pumpkin, you can focus just on this area for thinning the walls. 🎃 Now you've learned how to hollow this out, come see how to make a fairy house pumpkin for Halloween. Use a purpose made scoop which has serrated edges to make this thinning process easier or press a bit harder with a metal spoon. Either method can help you to thin the insides down to properly hollow out your pumpkin for Halloween.